Parasitic worms found in a North Korean soldier have highlighted nutrition and hygiene problems experts say have long plagued the isolated and impoverished communist state. The soldier was critically injured when he was fired on by North Korean soldiers as he crossed the demilitarised zone during a dramatic escape to South Korea, and was airlifted to hospital on Monday (November 13). 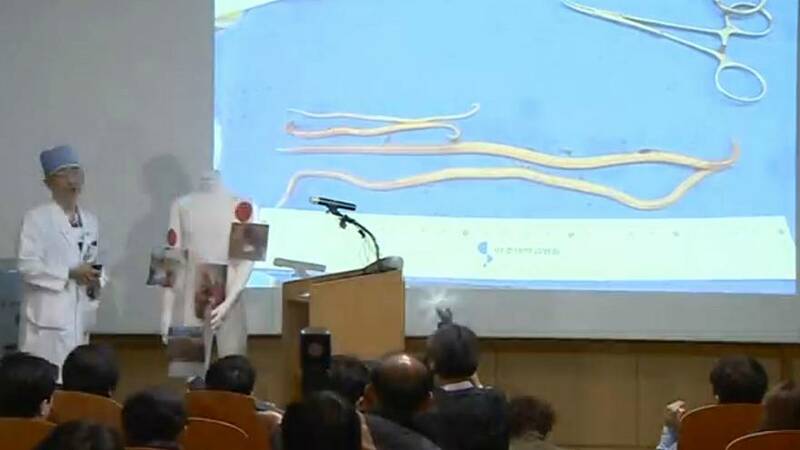 At a briefing on Wednesday (November 15), lead surgeon Lee Cook-jong displayed photos showing dozens of flesh-coloured parasites – including one 27cm long – removed from the wounded soldier’s digestive tract. “In my over 20 year-long career as a surgeon, I have only seen something like this in a textbook,” Lee said. The parasites, along with kernels of corn in his stomach, may confirm what many experts and previous defectors have interpreted from the food and hygiene situation for many North Koreans. Experts believe that the discovery of such parasites in the soldier provide indirect evidence that infection problems have been prevalent in North Korea. Lee said that parasitic worms, once common in South Korea 40 to 50 years ago, had all but disappeared as economic conditions greatly improved. Hong Sung-tae, a professor at Seoul National University College of Medicine who specialises in parasites, says their presence north of the heavily fortified border dividing the two Koreas could be in part tied to the use of human excrement. “Due to the lack of fertiliser, North Koreans fertilise their fields with human excrement. And this becomes an immediate cause of the parasitic infection,” he added.